The following post details a brief investigation of this error. It does not lead to a fix, but may offer pointers in the right direction. Failed to connect to SnapManager for SQL Server. 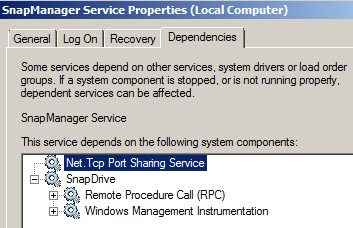 Please make sure that SnapManager Service is running on that system. Details: There was no endpoint listening at net.tcp://HOSTNAME/NetAppServices/SMSQLServices/Service that could accept the message. This is often caused by an incorrect address or SOAP action. See InnerException, if present, for more details. 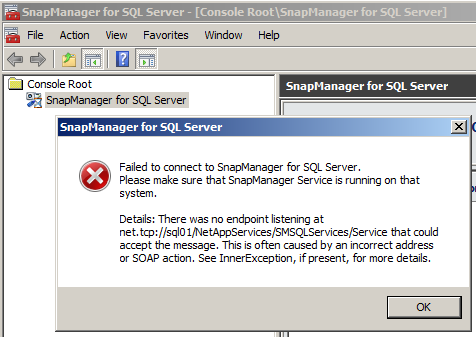 6) Now try adding the SQL server in the SnapManager for SQL Server MMC and you will get the same error. 1) The following NetApp Communities thread suggests you can change SME default ports (SME 6.0 defaults to 810) by editing the config files with the new port value, and applying a registry key. The string (REG_SZ) “ServerPort” with value being the new port number! After attempting to change SMSQLs default port from 808, and not encountering any success, and reading another KB mentioning that it cannot be changed from the default, I’ve reached the conclusion that this method will not work. Please comment if you’ve been able to do this - many thanks in advance J! Most likely, perhaps a Windows update or similar has broken the dependency with the Net. Tcp Port Sharing Service. Without ‘Net.Tcp port Sharing Service’, all these services will not be able share port 808. ‘Net.Tcp Port Sharing Service’ should be ‘Started’ and ‘Automatic’. Potentially, something else could be trying to share port 808, and these may not allow Net.Tcp port sharing. Check for other programs using port 808 and disable to investigate their effect. I've been stuck on this issue for a few days now, and the only thing that solved the problem for me was to uncheck the two boxes in IE options. This is so weird though, as i never saw anything that could indicate a certificate issue, and i've been looking around a lot for this problem! Thank you for the comment Nicolas, and thank you for reading. Thanks a lot, Brilliant stuff! 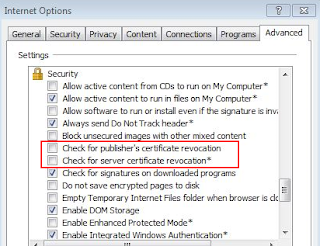 I had the same issue, and unchecking those two boxes in the IE did it. I still can't get a clue as what broke it, I have a test lab and nothing goes out to internet, there were no updates made to it. Only thing I remember that I added NetApp DSM for MPIO, and since then it broke. You explained it very well!! Keep sharing such good knowledge.